The Forty-First U.S. Army Engineer General Service Regiments. (Singing Engineers) was an elite, cadre-training unit manned by Black engineer soldiers during World War Two. The first battalion of this regiment, under the command of Colonel John E. Wood, had been given the important assignment of building roads, bridges, and docks in Liberia, West Africa. The mission of this regiment was to give engineering support to troops securing one anchor of the last line of defense in the African campaign against the Nazi General, Rommel. 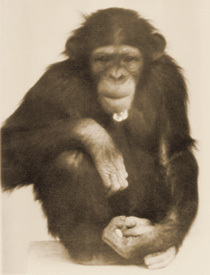 Susie, a chimpanzee, a native of Liberia, was acquired as a pet from a tribesman by Captain Brinkley. About a year old, she quickly became everybody's pet and soon became the official battalion mascot. There could not have been a better morale booster for men operating in such a remote area of the world. I met Susie in 1942 when my battalion, the second battalion was ordered to rejoin the first battalion which by now had moved north from Africa to the island Corsica. Captain Brinkley still owned Susie and saw to her welfare. Shortly thereafter we were ordered to Southern France. Susie, the only female member, was included in the order. As regimental supply officer, my reputation was soon to be tested by Miss Susie. Late one morning, thick black smoke billowed from an old abandoned tile factory near LeMille, France. Four of our lieutenants had been lucky enough to commandeer one of the offices to serve as living quarters complete with Army cots and running water. Rushing to the room to see what was burning, we found Susie sitting calmly on one end of a furiously burning bed with three lit cigarettes in her mouth. She had lit the cigarettes with a Zippo lighter and then placed the flaming lighter on the bed covers. Lieutenant Pribble, dousing the flames with a bucket of water, scolded her severely and cuffed her ears. Susie emitted screams of protest and indignation, but mostly of hurt feelings. Susie's reputation for misdeeds, especially pilfering, was already not good. She frequently raided footlockers and stole candy, cigarettes, and chewing gum. She often was seen chewing enormous four-pack wads of gum. My fellow officers were now looking to me to provide protection from this undisciplined maverick. They expected me to furnish padlocks so that there would be no more repeats of this last fiasco. As I said, my mettle as a supply officer was tested in this case. Of all the hardware carried in the vast military supply system, padlocks were not to be found, nor did the local French merchants carry padlocks. I ended up writing to my wife in the States, who, after considerable searching, found a dozen locks and sent them to me for issue to the poor vandalized lieutenants. What I am about to tell is unbelievable, but nevertheless true. Each padlock had only one or two keys. Thus, after installing the locks on the doors, the officers agreed to place the key on the door ledge after locking the door and leaving for the day's duty. This arrangement was satisfactory for the first day only. On the second day, the returning officers found not only the door unlocked and open, but found Susie on the floor with three steel helmets full of soapy water slushing neckties, socks, overseas caps, handkerchiefs up and down in the water like a wash lady out of control. What a terrible soapy, wet mess! It remained a mystery how Susie had gained entrance. It could only be surmised, but never fully proven, for no one would ever admit, that one of the officers had shown Susie how to use the key, or inadvertently, she had seen one of the officers use the key to enter the room. While she was a clever imitator, no one would ever dream she would have understood the complete sequence of operations needed to enter the room. Susie had never been caged. She was indeed allowed complete freedom to roam, even to visit alone the nearby village of LeMille, visiting the bars, sometimes being offered wine as she sat on the bar stool alongside of the other drinkers. To get back to our bivouac when she was ready, she would bum a ride in one of our passing jeeps or some other military vehicle. When Susie did her mischievous things, her victims feigned disgust and issued warnings and threats to banish her forever, but deep down they really liked Susie. After the anger subsided all would be forgiven and forgotten until the next episode which would not be long in coming. Susie could melt your heart with her endearing ways; always quick to greet you with a friendly outstretched hand; anxious to give you a strong hug about the neck. On a chance meeting she would reach for your hand and walk along with you regardless of your destination. Her blackest day came, when our new regimental commander, Colonel Lapsley, called Captain Brinkley in "on the carpet" and ordered that he "cage the dame monkey now, this moment, and keep her under control, or else that monkey must go." All that Brinkley could say was, "Yes, Sir." What precipitated this stern order, was Susie's entrance that day into Lapsley's sleeping quarters. Upon finding a fresh cantaloupe, she proceeded to dig a small opening with her fingers and pumped the entire contents, seed and all, over the clean bed clothes. Also while in the room, she ingested all of Lapsley's precious vitamins and two bottles of wine, breaking the bottle necks to pour the wine. Within in the hour, a large cage was under construction to restrain and house Susie. Her pitiful plight evoked much sympathy from our men as they passed by her cage all day. Susie pressed her nose against the cage wire and with outstretched arms pleaded to be freed. No one failed to give her a word of encouragement and a tap on her fingers. The poor hapless animal, having had her freedom so long, was now a prisoner. While the sentence was harsh, Colonel Lapsley was actually an ardent proponent of this animal. It was obvious that he enjoyed the responsibility of commanding an elite Army Engineer regiment; he also enjoyed being identified with the unit that had such an unusual mascot. But this cantaloupe and vitamin caper was messy and, admittedly a bit too much. With all the sympathy and empathy in the air, and with those pleading brown eyes and outstretched arms haunting one and all, the reader might guess that after three days someone unlocked the cage door and Susie was free. We watched for a reaction from Colonel Lapsley when he walked through the assembly area a few hours later and saw Susie appearing very happy to be free. Colonel Lapsley made absolutely no comment, as though the sleeping quarters catastrophe had never happened, and that it was normal and necessary to see Susie in the open. With everyone now in his proper place of duty, the regiment could now carry out its vital war-time military mission. Susie ate regular G.I. food, and always showed up at chow time, either in the enlisted mess or in one of the officer's mess tents. Interesting to me as a chemical engineer was Susie's apparent intuitive ability to utilize the principle of heat transfer. She enjoyed a warm cup of coffee. She tested the coffee with her tongue and would then add sufficient smooth pebbles, one or two at a time, adding more as necessary, until she had adjusted the temperature to her liking. Then she'd drink from the cup, dunking bread or other morsels of food before eating them. Occasionally stray dogs would show up encouraged by G.I. 's eager to have a pet. Returning from a week-end pass, one such soldier brought back with him a 3-week old puppy. Susie spotted the puppy, and at first sight, her maternal instinct was activated. She scampered over to the puppy, stopped and cuddled him for a few minutes, and then to everyone's consternation, grasped the puppy under one arm and proceeded to climb the outside wall of the tile factory building. Clinging to the fire ladder and downpipes, she continued upward. After some 20-minutes, stopping from time to time on window ledges to get a firmer grip on the puppy, she reached the roof. 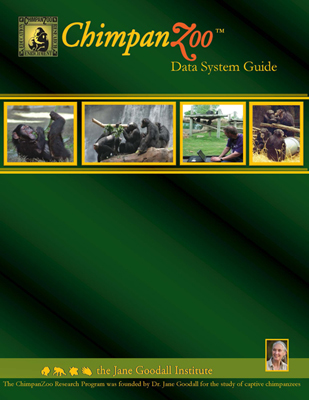 She seemed to realize that the puppy could no cling to her as a baby chimp would to its mother. By now, a large group of soldiers had gathered to watch this drama unfold. Some were betting that she'd drop the dog before reaching the roof. Others were betting that she'd leave the dog on the roof with no means of escape. But after an hour of playful fondling of the puppy, she returned down the sheer face of the building and deposited him safely on the ground. A number of ordinary snapshots had been taken of Susie, but Captain Zahn, a regimental surgeon, felt we should have an official photograph taken by a professional photographer. Zahn lived to regret his decision to volunteer for this outing to Aix en Provence, although he succeeded in returning with the photos. The main difficulty was Susie's insistence on being on the photographer's side of the camera. Her curiosity could not easily be quelled when the photographer placed her on a chair then covered his head with the black light-blocking cloth. Each time the photographer posed her on the chair and prepared to squeeze the bulb, he found Susie not on the chair, but under the cloth with him, twice collapsing the tripod and making the photographer very nervous. Fortunately the camera was not broken and Captain Zahn was relieved when his nerve-racking session was over, to say nothing of the expression of relief on the face of the photographer when he bid Zahn and Susie adieu. Surprisingly, Susie was very photogenic and the pictures turned out well. I had the honor of receiving one, which I still possess. Susie's out-going personality and friendliness, even to strangers, was legend. One day, 30 U.S. Army signal corpsmen came near our bivouac to install a cable. Susie was soon up a telephone pole and appeared to be helping to string wire with some tool a signalman had handed her. When the men moved on to other poles, Susie remained behind on one pole giving the appearance of being part of their team, the part that remains behind to secure and anchor the wire as the other team members go on forward to stretch the cable, or so it seemed. This team operation went on for several hours until Susie, becoming bored, descended, crossed the road and came home. The signal corpsmen were surprised to have a chimpanzee join their efforts, but they quickly accepted it, and the interaction and nonchalant attitude of both the men and Susie would cause a casual observer to believe it was an every day occurrence for these people to be assisted by such a special team member. When Captain Brinkley announced one day that he had received orders to leave the regiment and return permanently to the States, having accumulated sufficient overseas duty points, his friend, Captain Levi, agreed to "adopt" Susie and supervise her welfare. For many months, Levi had saved all of his dried fruit and most of his gum and candy for Susie, the fruit having been sent to him by his parents for his enjoyment. Soon after Brinkley's departure, Levi was alarmed one day when no one had seen hide nor hair of Susie. Levi, inquiring of the French villagers, learned that Susie had joined a British Army signal unit heading for the front lines. Levi was frantic as he sought an audience with Colonel Lapsley for help for a possible retrieval of the chimp. He requested leave-of-absence to race northward in an attempt to overtake the British unit. Levi was pleased when the Colonel granted him 48-hours and permission to use one of the regimental jeeps. But the order was clear that Levi must head back after 24 hours to arrive no later than the end of the second day. Levi returned empty handed. His inquiries along the way proved that he was on Susie's trail, but that he had started too late in pursuit. A month later, Susie was reported to be in the Marseille zoo. 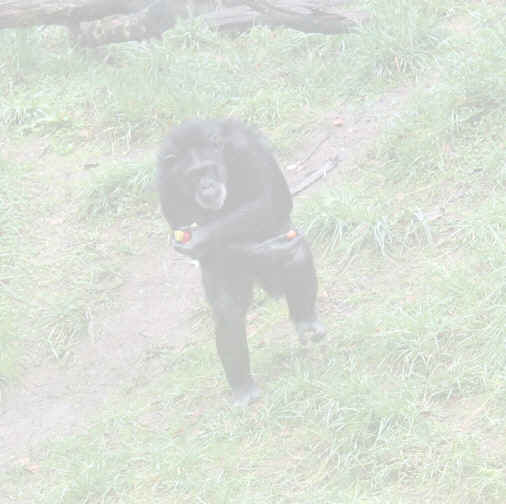 One of the officers on a week-end leave was quite certain that he recognized Susie in the ape division of the zoo. Hearing this, Levi lost no time heading for Marseille with a large bad of dried fruit he had been saving along with candy bars and packs of gum. He returned shortly saying that, yes, Susie was indeed in the zoo. Levi had appealed to the keeper to allow him to enter the cage. The keeper, at first, warned Levi that the chimpanzee was "Tres ferrocious," but Levi convinced him to allow his entrance to the cage. On entering the cage, it was instant recognition and a joyful reunion. Susie jumped into Levi's arms with screams of joy and held close to him. Levi left the fruit, the candy, and the gum, and returned to our bivouac. Levi, while sad to give her up, was satisfied that Susie would be fed and sheltered for the remainder of her days. We all missed her. I shall always have fond memories of Susie. 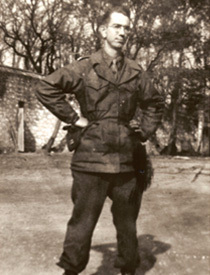 Colonel Kiefer as a young Army Captain stationed at Les Milles, France during WWII. 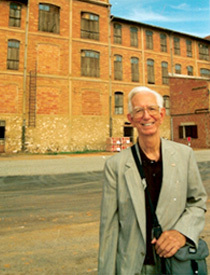 Colonel Kiefer at Les Milles tile factory (1993). Note iron fire escape ladder used by Susie to climb clutching a small puppy as if it was her own baby. to accompany the story she requested. ORIGINAL OWNER: Captain Brinkley of Fayatteville, N.C.
41st U.S, ARMY ENGINEER REGIMENT. SIZE: Fairly mature female. Not unusually large. One day, a French mother pushing her baby in a stroller approached one of our guard posts making inquiries about a soldier friend. SUSIE was in the vicinity, made not of the lady, walked over and made a "soft bite" on the lady's arm. It drew no blood, but one of our soldiers accompanied her to the medical officer's ward. Our unit surgeon examined the arm and washed the place with medicinal soap. The lady laughed and seemed to thoroughly enjoy the attention she was receiving. Our surgeon offered a scenario to the effect that SUSIE'S maternal instinct was triggered and she felt an emotion of covetousness (jealousy, if you will) for the baby. Thus the "soft bite" out of frustration. FOOD: SUSIE dined on ARMY bill of fare same as the rest of us. Usually showed up at meal time at one of the officers' mess tent, but sometimes dining with the enlisted men. Towards dark each evening, SUSIE would show up at one or other supply tents. A supply sergeant would allow her to have any number of blankets, sometimes 8-10. SUSIE would spend as much as an hour each night preparing her bed by circling and circling the blankets. She resumed her activities at daylight the next morning. Not often, but sometimes SUSIE would bed down in some officer's bedroll between newly laundered white bed sheets This was not good. The officer would dump her out scolding her sternly. You never have heard such hurt feelings. Some times a little soft spank on her rump was enough. Then to add insult she was forced to find another bed with it now past her bedtime. Obviously SUSIE liked wine and coffee, but also a taste for any liquid, palatable or not. It was necessary to keep out of her reach bottles of SKAT (trademark) used as a mosquito repellent. I once saw her down an entire bottle of SKAT before I could reach her. It certainly must have been poisonous, although not fatally so. Frequently, mongrel pet dogs of all sizes would appear on factory (camp) grounds. Sometimes 3-5 dogs at one time. They, barking wildly and curious surrounded her as she moved forward. The dogs were harmless and seemed to enjoy the encounter with this strange creature/person. As she moved forward encircled by barking dogs, SUSIE would reach out every so often and tweak brought on more furious, high pitched barking, but no biting. SUSIE and the dogs appeared to enjoy this game. On one occasion I visited Captain Fox on a serious supply matter. He had handed SUSIE a hammer and a 5-gallon empty tin container. Captain Fox seemed to ignore the terrible din as she beat the can until it was flat, over a period of 20-minutes. I found it difficult to conduct this business meeting with Captain Fox, but I did not object since it was on Captain Fox's command territory and not in my jurisdiction. There was a better breed dog, a wire-haired terrier, owned by one of our enlisted men. This dog made sneak attacks on SUSIE and had bit her slightly on several occasions. SUSIE was justifiably terrified of this dog. Her defense was to climb a telephone pole, gate post. Our soldiers always came to her rescue. On one occasion I saw chased to a high position on a brick gate post. While waiting for the rescue she broke off a four-foot tree branch overhanging the post, and tried many times unsuccessfully to reach the terrier and whip him. Quite an interesting episode. Except for a very few times when SUSIE was confined to a very large wooden cage for not more than a day or two at a time, she was allowed to range freely throughout the camp site and in the village. This was probably not a good idea. She was frequently seen in the village entertaining small children. She also entered local bars, and would be served wine. Also not a good idea. She was never known to bite anyone, but she could have been injured by vehicles while crossing streets. She seemed to understand that the camp site was her home territory, military personnel were her friends, and she never wandered very far away. She interacted with the engineering soldiers on the close-by projects watching operations, handling the tools such as possible diggers, wire pliers and wrenches. She imitated the action of the tools, but not really understanding their use. Note: the story mentions that SUSIE used keys to unlock padlocks to obtain access to rooms in order to raid officers' foot lockers looking for cigarettes, candy, and chewing gum.